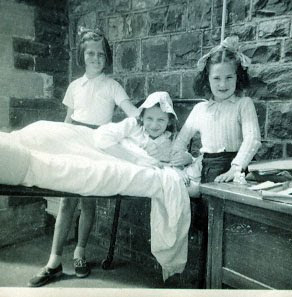 (From left to right) Mary , Ann ( in bed) and Caroline on the balcony of Craig-y-nos Castle. She tells me it gave her quite a turn when she picked up the magazine and read it in print. Well it came as something of a shock to me too when I bought a copy today from WH Smith and opened it to find a photo of Mary, Caroline and myself in Craig-y-nos. It is as if our history has been finally validated now its out in the common domain. "The Children of Craig-y-nos" by Ann Shaw and Carole Reeves ( price £9.99) published by The Wellcome Trust Centre for the History of Medicine, UCL.